When you ask parents about their biggest challenges, you'll find that many respond with getting their kids to do homework and maintaining regular sleep schedules. With so many other appealing ways for kids to spend time, getting them to stay disciplined and complete that extra bit of schoolwork can be tough! But never fear! There are strategies you can use to get it done and make it more fun. It is also important to dedicate a set amount of time for homework. This will discourage students from rushing through homework so that they can watch the latest tv show. What is a reasonable amount of time to spend on homework? That varies with age. Check with your child's teacher. And teach your kids about project management. Check in with them regularly to see how their planning and scheduling is working out. Be encouraging and not overly critical but be consistent with the message that they must work things out within the time they have available to them during the day (not during the time that is supposed to be their bedtime). If their plans are not working out, encourage them to begin thinking about how other activities need to be managed in order for them to meet their priorities. Don't accept no for an answer. A common refrain from students is "I finished my homework in school" or "The teacher didn't assign us any homework today." It should not matter that they don't have a specific assignment. Homework is an extension of the learning that occurred that day in school, and what they learned that day can be extended in any number of ways. Students can read silently during their allotted homework time, they can look at flashcards, practice math facts, and test their spelling. This is how to teach your child to be a self-directed learner. You will be giving your children a gift when you get them in the habit of doing this now. When they are in high school, having this extra study habit will bring them academic success. Establish a partnership with teachers. Early in the school year make an effort to get to know your child's teacher. Make an appointment to talk with the teacher in the first few weeks of school so that you can express your desire to be a good partner in your child's education. She will appreciate it, and you will be one step closer to a smooth school year. Find out what her homework policy is so that you know what to expect. Most people's advice on homework is to set up a desk in your child's room and make sure that they have a quiet and distraction-free work environment. This sounds very reasonable, but few people seem to be able to follow this advice. 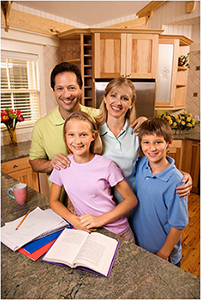 Many kids do their homework on the living room floor, at the kitchen counter, or at the dining room table. It seems that some people work best when they aren't isolated from household activity. If that is the case with your child, then provide a small traveling office for him so that he has all of the necessary items at hand and won't waste time running around the house looking for a sharp pencil. With all the supplies nearby, and distractions limited to the general background noise of family living, your student ought to be able to concentrate on homework. "Do as I say not as I do" is no longer considered appropriate parental advice. In order to instill the proper values in our children, we must model them. If we expect our children to be conscientious, hard-working students, then that is what they must see in us. Make an effort to show your children your work ethic by putting yourself to work while they do their homework. Read or work on that unfinished paperwork. Take out a pencil and write notes as you read. Always be eager to learn something new. The more that you can show your child that learning is a lifelong adventure , the more likely it is that homework will cease being a chore and start being an integral part of a life well-lived. Start talking about getting reading for bed within 30 minutes of bedtime. This may involve finishing up homework, putting the electronics away, beginning their hygiene routines, and organizing themselves for the next day. When they are off to their rooms, remove their cell phones, shut down their internet (or better yet ensure the computer is in a quiet study space outside their bedroom) and remove any video games. Lights should be dimmed and curtains shut. The alarm should be set for at least 8 hours of sleep, leaving enough time to get ready in the morning. Try to avoid arguments before bed because increased stress will impact your child's ability to sleep. This may be difficult at first because they may resist conforming to a routine. In advance, speak to them calmly about the importance of sleep and how you are committed to providing the best environment possible for their healthy development and success. Do not waiver. Be consistent and eventually they will realize that this is the new normal. Model healthy habits, including a consistent sleep routine. Be consistent with your bedtime routine, too. Demonstrate the importance of healthy sleep habits and before bed behavior! Just like you model healthy work habits, live a rested and healthy lifestyle that will benefit both yourself and your kids. If you take the time to set up these parameters around homework and bedtime, you'll find that you waste less energy battling with your child. You'll have more time and energy for other pursuits, and so will your child!